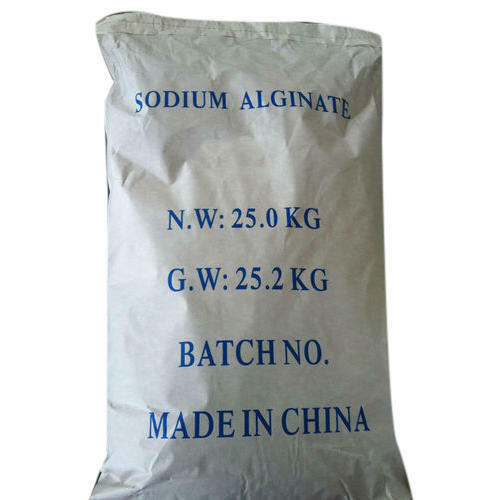 Sodium Alginate is a natural polysaccharide product extracted from brown seaweed that grows in cold water regions. It is soluble in cold and hot water with strong agitation and can thicken and bind. In presence of calcium, sodium alginateforms a gel without the need of heat. Pharmaceutical. Alginic acid is used in several pharmaceutical applications.Alginic acid is compounded into tablets to accelerate tablet disintegration for a faster release of the medicinal component. Alginate forms a gel in the highly-acidic stomach and protects the stomach mucosa. Focusing on customers needs and aimed for their absolute contentment, Sha Narendra & Sons is dedicated to trade, wholesale, export and import best in class products since 1982. Situated at Govindappa Naicken Street, Chennai, Tamil Nadu, we are facilitated by vast distribution network; we are able to reach the clients nationwide. As a sole proprietorship based organization, we are leveraging on the advanced technologies and our in-depth acquaintance for delivering a wide array of Chemical Powder, Laboratory Chemical, Cocoa Powder, Methyl Salicylate and Mercury Chemical. Our major concentration is purveying contentment to our customers catering to their needs in best possible manner. Today, we are one of the leading suppliers all over India purveying customers brand loyalty, rendering nationwide. Our constant collaboration with the dealers by providing the goods regularly by catering their demands enabling them to further meet the growing market demands has made us as an emerging trader of optimal products over the years.